I first posted a review of Alastair Reynolds' fearlessly ambitious Revelation Space, what was to become the first book in a trilogy, in 2002. And while I acknowledged most heartily that Reynolds "has more imagination in two brain cells than perhaps the entire populations of several small towns," I was, in the end, disappointed, giving the book two stars and labeling it "a colossal bore." Reynolds' adventure, I thought at the time, was simply crushed under the weight of his verbose, detail-obsessed prose. But something kept nagging at me in subsequent years, in a way that I am almost never nagged after disliking a novel. No, it had nothing to do with the fact that mine was a minority opinion among critics, most of whom were tossing out "Best Science Fiction Novel of the Year" clichés as fast as their fingers could type. I try never to let either popular or critical opinion influence me if I can help it. My thinking is that going into a book as cold as possible will result in the most honest opinion. What was nagging me was that, despite my disappointment, images and bits and pieces of the novel simply would not get out of my head. This is saying something, since, with the volume of SF and fantasy I read, I do not exactly retain an eidetic memory of everything I've read that I can call up in a second or two unless the book literally bowled me over. But in the case of Revelation Space, two and three years later I still could remember the opening scene in the archaeological dig on the lonely planet of Resurgam with remarkable clarity. 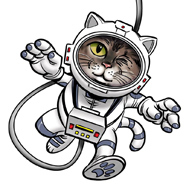 The dark, eerie corridors of the vast starship Nostalgia for Infinity still brought haunting images to mind. Had I just missed something? Perhaps I had read Revelation Space at a time that I was not very receptive to epic SF. (I suspect that having since gone on to read the work of Peter F. Hamilton and Dan Simmons, SF of this monumental scale has become more appealing to me now that I've seen it done well.) Or was this all just wishful thinking, and the book truly a soporific snoozefest? There was only one thing to do: re-read the book. And while re-evaluating something you've originally panned isn't a common practice among critics, we should be open-minded to doing so when the occasion warrants. (And it doesn't always, so don't expect a new review of The Eye of the World.) Often works of art are released before their time, like Blade Runner. Or their qualities are only evident to some audiences right away, while other audiences have to warm to the work over time. Well, upon re-reading Revelation Space, I will say that to a large extent I maintain some of my original opinion. This is an often ponderous epic. Reynolds has so many Big Ideas to communicate to his readers that he falls into the hard SF writer's most commonplace trap: the infodump. Passages go on at g-r-e-a-t length to elucidate some aspect of Reynolds' extravagant future. But there's nothing anywhere that could be called bad writing. The complaint is more akin to that hilarious line from Amadeus: "Too many notes!" Clearly Reynolds' universe is more important to him than his characters. So not only does the cast never fully reach the point of perfect reader identification/empathy, it seems that Reynolds knows it and couldn't care less. It's the big picture that matters to him. But if, in a manner of speaking, Reynolds can't see the trees for the forest, you can't deny that it's an astonishing forest. The story revolves around the quest to discover what led to the extinction of the Amarantin, a pre-technological race that once inhabited the bleak world of Resurgam, orbiting Delta Pavonis. Resurgam is now a human colony wracked by political upheaval. Dan Sylveste is the son of one of Resurgam's founders, the infamous leader of the Eighty, the unwitting victims of a bungled immortality experiment. Sylveste is on the cusp of a crucial discovery — an Amarantin obelisk with engravings that hint at technologies this species should never have had — when he is unseated from power in a coup. He is only released after 20 years when his former rival, Nils Girardieau, requires his help in understanding the dazzling discovery that the obelisk has led to: a buried Amarantin city, encased two kilometers beneath the surface of Resurgam in a black sphere. Two other groups of players enter the stage. From the rather Ridley Scott-ish Chasm City, on a planet in the Epsilon Eridani system, we meet assassin-for-hire (this seems to be the job du jour of hot chicks in the far future) Ana Khouri, who is hired — well, conscripted, actually — by a mysterious wealthy dowager named the Mademoiselle to travel to Resurgam and, for reasons cloaked in obscurity, take out Sylveste. Through plot machinations that, it must be said, are a bit clunky, the Mademoiselle forces Khouri to work for her with the aid of a rather implausible twist concerning Khouri's long-lost husband. Then, Khouri infiltrates the crew of the Nostalgia for Infinity, an unimaginably massive ship ("unimaginably massive" seems to be the only level at which Reynolds will even deign to consider an idea) whose skeleton crew of cybernetically enhanced human "Ultras" are journeying to Resurgam also to find Sylveste. But they aren't looking to kill him; they believe Sylveste can help combat a mysterious viral plague attacking the ship's systems and endangering their captain, Brannigan, who's been in suspended animation at near absolute zero at little better than "brain in a jar" status. But why, Khouri wonders, is the ship looking for a gunnery officer? And where did it get all its gargantuan WMD's, some of which could probably take out whole stars? Before the characters all come together, Reynolds shows a deft hand at building cosmic mystery while slowly weaving thematic threads together. The Nostalgia's previous gunnery officer went mad, raving to Ilia Volyova (one of the ship's triumvirate of commanders), before she was forced to kill him, about some being he calls the Sun Stealer. And Sun Stealer appears to be the name attached to the sculpture of an enigmatic winged deity, not previously known to be part of Amarantin religious traditions, found within the buried city. Tied into all of this is an even more bizarre enigma, that of the unspeakably alien Shrouders, who maintain areas of distorted spacetime — the Revelation Space of the title — which are rumored to protect vast repositories of wildly advanced technologies. Dan Sylveste is the only human to have ventured into Revelation Space and returned alive. And what he learned there is a key mystery of the plot. All of these riddles wrapped in mysteries inside enigmas sometimes, not surprisingly, overwhelm the narrative. It will be the patient, not easily daunted reader who will find Revelation Space most rewarding. (For one thing, we're nearly 200 pages into the book before we get anything resembling action.) The narrative is non-linear in a way that sometimes lacks clarity, popping forward then back again over gaps of decades, and there are odd hiccups in plausibility such as the one I mentioned before. Most readers who choose to tackle this book may find it's best read in small chunks. The meticulous, nearly obsessive attention to detail in this huge narrative results in a story that can be as daunting and difficult as it is compelling. Still, you'll find a lot to like in those details, including hints at Reynolds' disparate influences. Khouri's career choice in Chasm City — she stalks clients who pay to be stalked, and it's all captured by the media — has echoes of Robert Sheckley's The 10th Victim. And there's something about that buried city (not to mention the Shrouders themselves) that's more than a little Lovecraftian. Finally, the reason this book satisfies where similarly overwritten epics don't is that Revelation Space does have a focused storyline that Reynolds is driving towards a climax. (And what a climax!) Too many books like this commonly leave several unresolved plot threads gaily swinging in the breeze, leaving readers with the forlorn hope that all will be tied together in some distant future sequel. Revelation Space leaves plenty open for its sequel, too, but it doesn't do so in such a way that it's a letdown in its own right. 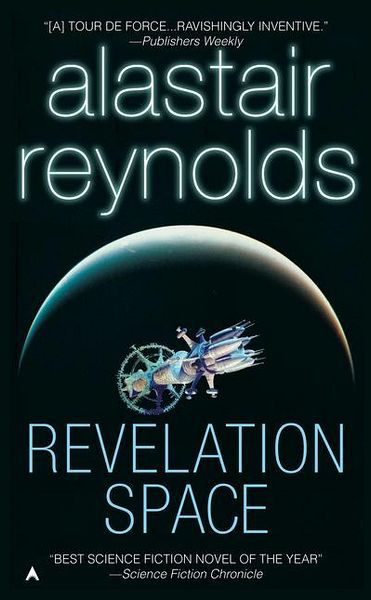 Given that this trilogy's second and third novels are even longer than Revelation Space, I don't get the impression that Reynolds' self-indulgence is a thing he's felt any particular compunction to rein in. But I have confidence he knows how to smooth his rough edges. And as writers like Simmons, Martin, and Hamilton have proved, there are ways to do Bigness well. This debut reveals a powerful imagination straining at the leash to explore the Biggest Ideas it can tackle. And as we all hopefully would agree that SF ought to be, at the best of times, a literature of Big Ideas, to criticize a novel too harshly for attempting to excel at what this genre is all about — as opposed to falling back on the same overworked tropes — seems churlish. As Reynolds' career evolves, I suspect it's more likely that, rather than make his stories more accessible to readers who've long cut their teeth on undemanding work, he'll expect readers to evolve to his level, just to keep up. That's not a bad thing, and it might even prove a revelation. Followed in the trilogy by Redemption Ark, as well as Chasm City, a stand-alone novel set in the same future.